Baguette + Bacon = Brilliance! Thanks To Anna from The Daily Loaf for coming up with this amazing bread! Take a look inside - a lovely baguette flecked with bacon goodness! You know the adage - bacon makes anything better - couldn't agree more! Since today is Father's Day - Happy Father's Day to all of the Dad's out there - I decided to cook up a special breakfast treat - French toast, using my Bacon Baguette. For the batter - farm fresh eggs, Pennsylvania Organic Milk from Natural by Nature, and some Old Mill Gourmet Tahitian Vanilla Extract. French Toast with built in bacon - so amazing! For the topping - we tried delicious maple syrup from Old Mill Gourmet and some of the special strawberry vanilla preserves I made yesterday (watch for that post tomorrow!). After I recovered from my French Toast hangover I got to thinking about other possibilities for this bacon-y baguette. Here's three more options I came up with, but the possibilities are endless! Topped with tuna salad and a pickled leek from Old Mill Gourmet! Spread with Shellbark Hollow Chèvre and topped with chopped tomatoes from Kimberton CSA and a drizzle of Old Mill Argentinian Chimichurri! 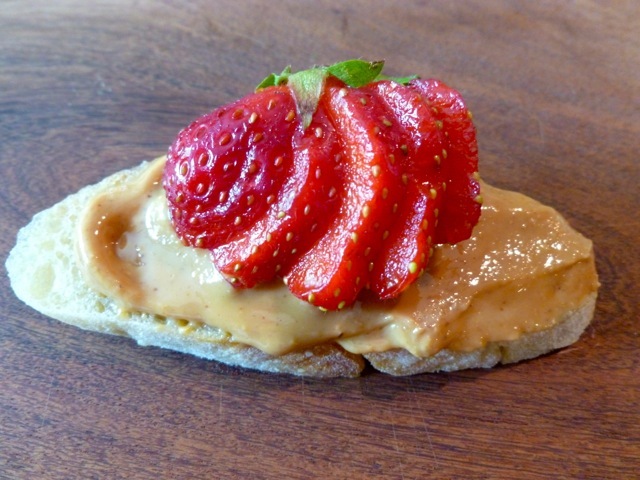 And lastly, taking a nod from Elvis himself - topped with peanut butter and a strawberry! Insanely excellent! I have more ideas, but I'm out of baguette! Anna promises to bring lots more next week! I've got one on reserve! Not to mention, I'm going to need to stock up on all things from Old Mill Gourmet - her products were made for these baguettes!